Flammable and combustible liquids are liquids that can burn. They are classified, or grouped, as either flammable or combustible by their flash points. Generally speaking, flammable liquids will ignite (catch on fire) and burn easily at normal working temperatures. Combustible liquids have the ability to burn at temperatures that are usually above working temperatures. There are several specific technical criteria and test methods for identifying flammable and combustible liquids. Under the Workplace Hazardous Materials Information System (WHMIS) 1988, flammable liquids have a flash point below 37.8°C (100°F). Combustible liquids have a flash point at or above 37.8°C (100°F) and below 93.3°C (200°F). the minimum temperature at which a liquid gives off vapor within a test vessel in sufficient concentration to form an ignitable mixture with air near the surface of the liquid. The flash point is normally an indication of susceptibility to ignition. The flash point is determined by heating the liquid in test equipment and measuring the temperature at which a flash will be obtained when a small flame is introduced in the vapor zone above the surface of the liquid. Class II liquids shall include those with flash points at or above 100ºF (37.8ºC) and below 140ºF (60ºC), except any mixture having components with flash points of 200ºF (93.3ºC) or higher, the volume of which make up 99 percent or more of the total volume of the mixture. Class IIIA liquids shall include those with flash points at or above 140ºF (60ºC) and below 200ºF (93.3ºC), except any mixture having components with flash points of 200ºF (93.3ºC), or higher, the total volume of which make up 99 percent or more of the total volume of the mixture. Class IIIB liquids shall include those with flash points at or above 200ºF (93.3ºC). This section does not regulate Class IIIB liquids. Where the term "Class III liquids" is used in this section, it shall mean only Class IIIA liquids. Class IA shall include liquids having flash points below 73ºF (22.8ºC) and having a boiling point below 100ºF (37.8ºC). Class IB shall include liquids having flash points below 73ºF (22.8ºC) and having a boiling point at or above 100ºF (37.8ºC). Class IC shall include liquids having flash points at or above 73ºF (22.8ºC) and below 100ºF (37.8ºC). Flammable and combustible liquids themselves do not burn. It is the mixture of their vapours and air that burns. Gasoline, with a flash point of -40°C (-40°F), is a flammable liquid. Even at temperatures as low as -40°C (-40°F), it gives off enough vapour to form a burnable mixture in air. Phenol is a combustible liquid. It has a flash point of 79°C (175°F), so it must be heated above that temperature before it can be ignited in air. The lower flammable limit or lower explosive limit (LFL or LEL) of gasoline is 1.4 percent; the upper flammable limit or upper explosive limit (UFL or UEL) is 7.6 percent. This means that gasoline can be ignited when it is in the air at levels between 1.4 and 7.6 percent. A concentration of gasoline vapor in air below 1.4 percent is too "lean" to burn. Gasoline vapor levels above 7.6 percent are too "rich" to burn. Flammable limits, like flash points however, are intended as guides not as fine lines between safe and unsafe. A material's auto ignition or ignition temperature is the temperature at which a material self-ignites without any obvious sources of ignition, such as a spark or flame. Most common flammable and combustible liquids have auto ignition temperatures in the range of 300°C (572°F) to 550°C (1022°F). Some have very low auto ignition temperatures. For example, ethyl ether has an auto ignition temperature of 160°C (356°F) and its vaporous have been ignited by hot steam pipes. Serious accidents have resulted when solvent-evaporating ovens were heated to temperatures above the auto ignition temperature of the solvents used. Auto ignition temperatures, however, are intended as guides, not as fine lines between safe and unsafe. Use all precautions necessary. Well-designed and maintained ventilation systems remove flammable vapours from the workplace and reduce the risk of fire and health problems. The amount and type of ventilation needed to minimize the hazards of flammable and combustible liquid vapours depend on such things as the kind of job, the kind and amount of materials used, and the size and layout of the work area. An assessment of the specific ways flammable and combustible liquids are stored, handled, used and disposed of is the best way to find out if existing ventilation controls (and other hazard control methods) are adequate. Some workplaces may need a complete system of hoods and ducts to provide acceptable ventilation. If flammable vapours are likely to condense, the ducts should have welded joints. Other workplaces may only require a single, well-placed exhaust fan. Use non-ferrous fan blades and shrouds (housing), and explosion-proof electrical equipment in ventilation systems for these liquids. Regular cleaning of the ducts, filters, plenums, etc. will decrease the severity of any fires and will reduce the likelihood of spontaneous combustion if some self-heating material is present. Ventilation equipment used to handle solvent vaporous should meet the relevant fire code requirements. If the ventilation keeps vapour levels below the occupational exposure limit of a chemical, usually there is little risk of fire or explosion. Vapour levels harmful to people are, in most cases, much below the lowest concentration of vapour in air that can burn. For example, toluene has a workplace exposure limit of 20 ppm [50 parts of toluene per million parts of air or 0.005 percent] (ACGIH 2008 TLVs & BEIs) in many jurisdictions. This is far below the lower flammable limit (LFL) for toluene, which is 12,000 ppm (1.2 percent). In baking and drying ovens, enclosed air-drying spaces, ventilation duct work or other enclosures where workers are not normally exposed to the vapour, keep vapour levels to 20 percent or less of the LFL. Storage of Flammable liquids shall be in NFPA approved flammable storage lockers or in low value structures at least 50 feet from any other structure. Do not store other combustible materials near flammable storage areas or lockers. Bulk drums of flammable liquids must be grounded and bonded to containers during dispensing. Portable containers of gasoline or diesel are not to exceed 5 gallons. Safety cans used for dispensing flammable or combustible liquids shall be kept at a point of use. Appropriate fire extinguishers are to be mounted within 75 feet of outside areas containing flammable liquids, and within 10 feet of any inside storage area for such materials. Storage rooms for flammable and combustible liquids must have explosion-proof light fixtures. Bulk storage of gasoline or diesel are kept in above ground tanks. Tank areas are diked to contain accidental spills. Tanks shall be labeled IAW NFPA guidelines. All tank areas shall be designated no smoking - no hot work - no open flame areas. No flames - hot work or smoking is be permitted in flammable or combustible liquid storage areas. The maximum amount of flammable liquids that may stored in a building are 20 gallons of Class IA liquids in containers100 gallons of Class IB, IC, II, or III liquids in containers500 gallons of Class IB, IC, II, or III liquids in a single portable tank. Flammable liquid transfer areas are to be separated from other operations by distance or by construction having proper fire resistance. When not in use flammable liquids shall be kept in covered containers. Class I liquids may be used only where there are no open flames or other sources of ignition within the possible path of vapor travel. 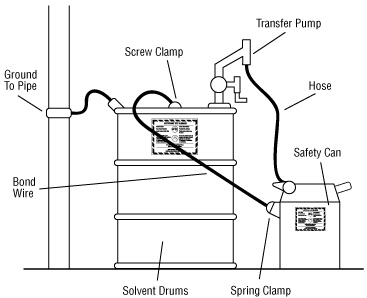 Flammable or combustible liquids shall be drawn from or transferred into vessels, containers, or portable tanks within a building only through a closed piping system, from safety cans, by means of a device drawing through the top, or from a container or portable tanks by gravity through an approved self-closing valve. Transferring by means of air pressure on the container or portable tanks shall be prohibited. Maintenance and operating practices shall be in accordance with established procedures which will tend to control leakage and prevent the accidental escape of flammable or combustible liquids. Spills shall be cleaned up promptly. Combustible waste material and residues in a building or unit operating area shall be kept to a minimum, stored in covered metal receptacles and disposed of daily. Rooms in which flammable or combustible liquids are stored or handled by pumps shall have exit facilities arranged to prevent occupants from being trapped in the event of fire. Inside areas in which Class I liquids are stored or handled shall be heated only by means not constituting a source of ignition, such as steam, hot water or forces central systems located away from the area. Good housekeeping and equipment maintenance are important wherever any chemicals, including flammable and combustible liquids, are used. Keep all areas where these liquids are stored, handled or used clear of burnable materials. Provide drip trays and empty them often wherever recurring leakages occur. Consider using splash guards to enclose machines or processes that eject flammable or combustible liquids. Clean up liquid spills immediately. Remove any obstructions that prevent containers with lids held open by fusible links from closing fully. Make sure that flammable and combustible liquids are not left where they could block or otherwise prevent people from escaping in case of a fire. Regular equipment inspection and maintenance are important for controlling the hazards of flammable and combustible liquids. Ensure maintenance personnel know the hazards of the materials to which they might be exposed. Carry out repairs to equipment properly, including special equipment like explosion-proof fittings. Fires and explosions have resulted from the addition of non-approved parts or equipment to approved systems. Do not use safety containers that are damaged in any way. If repairs using approved parts cannot restore safety containers to a safe condition, discard the containers once they have been properly cleaned. Not more than 120 gallons of Class I, Class II, and Class IIIA liquids may be stored in a storage cabinet. Obtain and read the Material Safety Data Sheets (MSDSs) for all of the materials you work with. Be aware of all of the hazards (fire/explosion, health, chemical reactivity) of the materials you work with. Know which of the materials that you work with are flammable or combustible liquids. Eliminate ignition sources (sparks, smoking, flames, hot surfaces) when working with flammable and combustible liquids. Use the smallest amount of flammable liquid necessary in the work area. Keep storage areas cool and dry. Store flammable and combustible liquids away from incompatible materials (e.g., oxidizers). Use approved containers for disposal of rags and other work. Store, handle and use flammable and combustible liquids in well-ventilated areas. Use approved equipment, including labelled safety containers, for flammable and combustible liquids. Bond and ground metal containers when transferring flammable and combustible liquids. Practice good housekeeping and equipment maintenance. Keep area clear of burnable materials. Know how to handle emergencies (fires, spills, personal injury) involving the flammable and combustible liquids you work with. Posted Danger, Warning and Hazard Signs. Keep only what you need on-site. Purchase materials in the smallest volumes necessary. At work locations, keep only those chemicals that are needed for the present task. Do not let hazardous wastes accumulate at the work site. Store products, including wastes, used at the work site in proper containers. Keep flammable materials separate from other processes and storage areas. Install properly designed ventilation in storage areas. Ensure that processes that use or make flammable materials do not exhaust back in the work site. Ensure that equipment, such as spray booths, where flammable materials are used, are exhausted outside of the building, and away from air intakes. Ventilation systems must be properly maintained and comply with the Building Code. It is important that the employer assess the work site and identify potential fire hazards. This will allow the employer to identify the best ways to control these hazards. Flammable gases stored in cylinders are usually at very high pressures, so their uncontrolled release can present both physical and flammability hazards. A small amount of the released gas can fill a large area with a potentially explosive concentration very quickly. This is particularly the case with liquefied gases such as Liquefied Petroleum Gas (LPG). protect hoses, connections and containers from damage and inspect them regularly for signs of wear. Flammable and combustible liquids can present a static electricity hazard depending on their ability to generate static electricity, how well they conduct electricity (conductivity), and their flash point. Solvents and fuels produced from petroleum (e.g., benzene, toluene, mineral spirits, gasoline, jet fuel) can build up a charge when they are poured or flow through hoses. They tend to hold a charge because they cannot conduct electricity well enough to discharge when in contact with a conducting material, like a metal pipe or container, that is grounded. When enough of a charge is built up, a spark may result. If the vapour concentration of the liquid in air is in the "flammable range" and the spark has enough energy, a fire or explosion can result. According to the NFPA (Code 77), solvents that are soluble in water (or can dissolve some water themselves) do not build up static electricity. Examples of such liquids include alcohols and ketones like acetone. However, when liquids are transferred into non-conductive containers (e.g., plastic, glass), even conductive solvents may build up a charge because the plastic or glass containers decrease the rate at which the charge in the solvent dissipates. The flash point and vapour pressure of the liquid and the temperature are other factors to consider. The vapour levels will be higher in the air around the container if you are working outside on a hot summer day than in the winter when the temperature is below 0°C (32°F) or colder. At higher elevations in the mountains, the air pressure is significantly lower and solvents boil at lower temperatures. Under these conditions, the flash point and the temperature for the optimal vapour/air ratio are lower and some "combustible" liquids can become "flammable". A liquid like hexanes has a low flash point and it is flammable when its temperature is in the range -33°C to -3°C (-28°F to +26°F) at sea level. At normal room temperatures, the vapour/air ratio at the surface of the solvent will be well above its upper flammability limit and would be "too rich" to burn. However, at some distance away from the solvent surface, there is a concentration of hexane vapour in the air that is in the flammable range. A fuel like kerosene is a combustible liquid with a flash point above 38°C (100°F). Under hot weather conditions or if high flash point liquids are heated to temperatures around or above their flash points, a flammable vapour/air mixture will form. Generally, the conditions for igniting a liquid are optimal when the liquid is used at a temperature that produces a vapour in air concentration (at the surface of the liquid) that is halfway between the upper and lower flammability limits. Recognizing that these conditions represent an "optimal" fire hazard, one has to take appropriate precautions. Transferring a liquid from one metal container to another may result in static electrical sparks. To prevent the build up of static electricity and prevent sparks from causing a fire, it is important to bond metal dispensing and receiving containers together before pouring. Bonding is done by making an electrical connection from one metal container to the other. This ensures that there will be no difference in electrical potential between the two containers and, therefore, no sparks will be formed. The best way to bond containers is to securely attach a special metal bonding strap or wire to both containers. Some liquid transfer pumps have self-bonding hoses. Bonding can also be done by keeping a solid metal-to-metal contact between the containers themselves or between a metal container and a conducting nozzle. These latter two methods are usually not reliable because a good electrical contact is often hard to make and maintain during the entire transfer. In the flammable liquid storage and dispensing area, ground dispensing drums. Grounding is done by connecting the container to an already grounded object that will conduct electricity. This could be a buried metal plate, a metallic underground gas piping system, metal water pipes or a grounded, metal building framework. Bonding both containers and grounding one of them "drains off" static charges and prevents the discharge of sparks. All grounding and bonding connections must be bare metal to bare metal. Remove all dirt, paint, rust or corrosion from points of contact. Specially designed and approved bonding and grounding wire assemblies are available from safety equipment retailers. Flammable or combustible liquids, including stock for sale, shall not be stored so as to limit use of exits, stairways, or areas normally used for the safe egress of people. Storage shall be prohibited except that which is required for maintenance and operation of equipment. Such storage shall be kept in closed metal containers stored in a storage cabinet or in safety cans or in an inside storage room not having a door that opens into that portion of the building used by the public. There are tables in the standard summarizing the storage requirements applicable to "General Purpose Public Warehouses." These tables refer to indoor storage of flammable and combustible liquids which are confined in containers and portable tanks. Storage of incompatible materials that create a fire exposure (e.g., oxidizers, water-reactive chemicals, certain acids and other chemicals) is not permitted. The last type of inside storage covered by this paragraph addresses storage in "warehouses or storage buildings." These structures are sometimes referred to as outside storage rooms. Practically any quantity of flammable and combustible liquid can be stored in these buildings provided that they are stored in a configuration consistent with the tables in this paragraph. Containers in piles shall be separated by pallets or dunned where necessary to provide stability and to prevent excessive stress on container walls. Stored material shall not be piled within 3 feet of beams or girders and shall be at least 3 feet below sprinkler deflectors or discharge orifices of water spray, or other fire protection equipment. Aisles of at least 3 feet in width shall be maintained to access doors, windows or standpipe connections. Requirements covering "storage outside buildings" are summarized in tables in this paragraph. Associated requirements are given for storage adjacent to buildings. Also included are requirements involving controls for diversion of spills away from buildings and security measures for protection against trespassing and tampering. Certain housekeeping requirements are given which relate to control of weeds, debris and accumulation of unnecessary combustibles. Suitable fire control devices, such as small hose or portable fire extinguishers, shall be available at locations where flammable or combustible liquids are stored. not less than 10 feet, nor more than 25 feet, from any Class I or Class II liquid storage area located outside of a storage room but inside a building. The reason for requiring that portable fire extinguishers be located a distance away from the storage room is that fires involving Class I and Class II flammable liquids are likely to escalate rapidly. If the fire is too close to the storage area, it may be impossible to get to it once the fire has started. Open flames and smoking shall not be permitted in flammable or combustible liquid storage areas. Materials which react with water shall not be stored in the same room with flammable or combustible liquids. Many flammable and combustible liquid storage areas are protected by automatic sprinkler or water spray systems and hose lines. Consequently, any storage of water-reactive material in the storage area creates an unreasonable risk.